As some of my readers know, I've been generally enjoying the Marvel Future Fight mobile game since it hit devices almost a year ago. 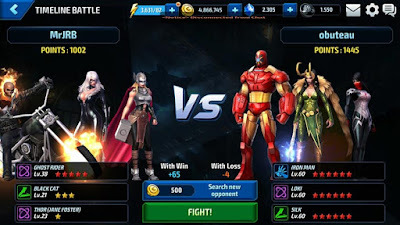 There's been a ton of new characters added, new costumes galore, and just an all around great amount of variance in ways to play the game. In the new Black Order patch, we get a cool new World Boss Mode related to the cosmic threat of Thanos with Proxima Midnight, Black Dwarf, and Corvus Glaive. On other thing they added was increasing a level's biometrics count from 3 to 5 a day. That is a huge change that will make a lot of people happy. However, lately there's been some changes that really took a few steps backwards in the fun factor department, and it has to do with the Timeline Battles. 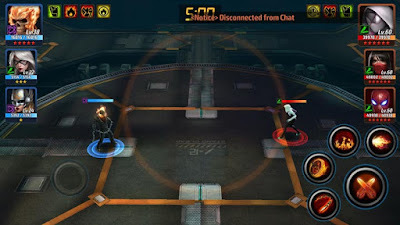 This part of play pits you against other players' teams and used to have the ability to change who you battled against. The last major Future Fight patch altered it to the game picking for you based on "score." 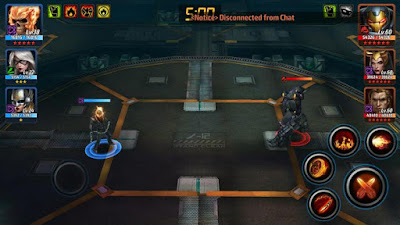 (Here's the link to Netmarble's official notes post) This method of matchmaking is damned awful because everyone begins with an even 1000 points. Which means that players with low levels like the ones I've been playing are pitted against players with fully maxed out teams they literally cannot hope to beat. Just look at the screen captures I posted below. When even a couple levels can mean certain doom, 30 plus level differences is catastrophic giving the player absolutely no way to come out a winner if they are on the low end. Netmarble claimed they would be fixing this in the new patch and, somehow, it got even worse. How am I still being put against teams I have no hope of winning? Even after trying to search for new opponents, I still keep getting placed against max level 60s! This is ridiculous. That isn't even taking into account the blatant imbalance between some characters- such as Spider-Man, Loki, and Hulkbuster Iron Man- that are all innately far too powerful against many other characters. 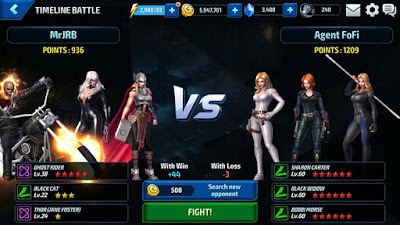 To top it off with something to make the changes even worse, they've cut off the ability to choose a new opponent unless you pay gold- and as soon as you "search for an opponent" it goes almost directly into the fight with a few mere seconds to stop the process. This might not be an issue, but if you'd like to earn the daily bonuses you have to participate in 5 Timeline Battles. 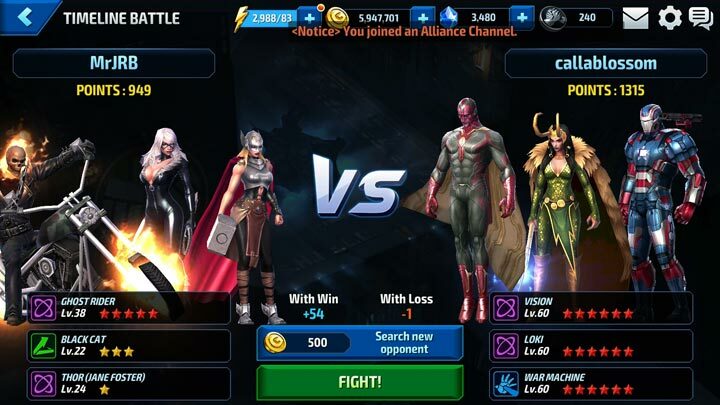 Many of us have grown accustomed to logging in and getting crushed for 5 battles because there isn't a way to fairly play with the current system- maybe Netmarble needs to match by levels instead of a score that everyone begins at. Seriously Netmarble, this is easily the worst part of the game. Timelines began all right, but it has progressively gotten worse with each patch, and I'm not even close to the only person that hates this new Timeline system. Oh- and I'm still very, VERY displeased with the fact I bought the "subscription" package and got some Carnage biometrics and then used some on other days for other characters, and now I can't choose him with normal biometrics from the Combat selector ones after initially unlocking him. Meaning if I don't use the subscription for EXCLUSIVELY him, I can't level him later. Not cool at all.